Major design and innovation firms have done a great job as ambassadors for the discipline over the past few decades. Design Thinking has gone mainstream. While the discussion about what the next big thing in Innovation is keeps going on, they might have fallen victims to their own success. It comes natural for clients to start a project with the wrong brief. Often it will sound something like “I've seen what you did for company X. We want something like that!”, or “We want a new website.” or “Design a product that does X.”. 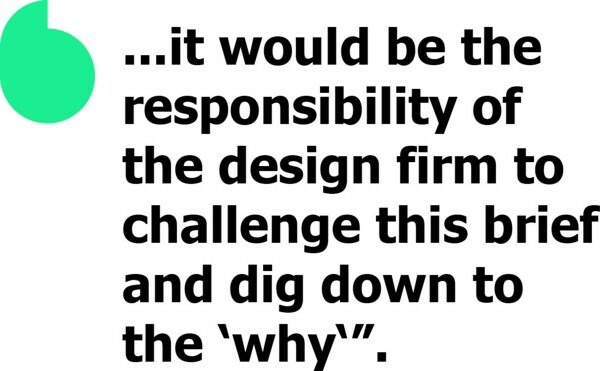 Here, it would be the responsibility of the design firm to challenge this brief and dig down to the “why”. What problem is the client actually trying to solve or which issues are their customers actually facing? However, many companies prefer to play safe and deliver what is expected of them. Often they are even proud of their heritage and tradition in delivering the same kind of service for decades. These days it is very easy for clients to find a company that helps them to build a new web presence, develop their brand, bring a new product to market, design packaging or develop an app; but if you want to start a step earlier and ask the question how to disrupt a certain market, it gets trickier as traditional design businesses are hesitant to adapt their structure and allocate resources accordingly. In design education — often the pioneer of paradigm changes — many universities have understood that the future of innovation requires cross-disciplinary problem-focussed thinking. The post-graduate course Innovation Design Engineering, which is run jointly between the world-renowned Royal College of Art and the School of Engineering at Imperial College London, is such a program. Here, students from a large variety of backgrounds learn to tackle complex issues by engaging with experimentation, design, engineering and enterprise activities. In the process, many traditional design skills are acquired, but it is understood that these are not the primary aim, but merely tools to help achieve something greater. As design businesses are slow to pick up the pace, many graduates feel disillusioned when trying to find a similarly progressive workplace later, and often found their own start-ups instead. This means that the formerly so popular design consultancies are running the risk of missing out on great new talent with the ambition to bring about change. As companies of any scale, from startup to multinational corporation, realize the potential of design thinking across industries, they seek to build strong in-house design capabilities, instead of outsourcing to design consultancies. One major innovation firm reportedly had to close their San Francisco office due to competition from in-house design teams in Silicon Valley. As the bar for innovation and design work has become much higher, design businesses are forced to find new ways to deliver and demonstrate value. On the outside, most design businesses emulate the image of the friendly and buzzing creativity hub with googly offices, NERF guns at their desks, and walls full of post-it notes. However, the reality often looks rather different. A former colleague of mine who recently quit his job at a South London design firm said: “They sell disruption, but their spirit is so old fashioned. 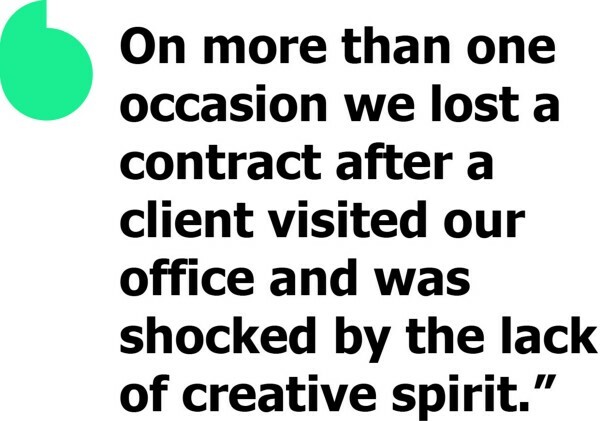 On more than one occasion we lost a contract after a client visited our office and was shocked by the lack of creative spirit.” This was one of the most shocking pieces of information I recently heard. They didn’t lose business because they were too expensive, to slow, or because the quality of work wasn’t good enough. They did so, because they didn’t demonstrate creativity in their own workplace. While this is an extreme example, it is not uncommon for design firms to operate in similar ways. Another major East London firm with global clients is notorious for extreme working conditions, long hours, mediocre pay, lack of creative vibe, and consequently, quick turnover of employees. Instead of coming up with new ways to stay relevant and generate profit, they pass the growing financial pressure directly on to their staff, while operating in the same way they always have, and it remains to be seen whether they have begun to dig their own grave in the process. The trend of design in-sourcing and old fashioned and risk-avert management inside design consultancies presents some big challenges. However, the independent design business still is an important one. As a result of the contract-based nature of their business, design firms have the unique and critical ability to bring a truly interdisciplinary approach to problem solving, and do what industry specialists often struggle with: to think outside of the box to generate ideas, to connect all ends in increasingly complex systems, and to provide vision and drive progress in industries far beyond the bounds of individual projects. What it takes now is bravery from their management to break the chains of traditional ways of working, to listen to their designers, to apply innovative thinking to shape their own business, really to trust in their own methods and capabilities. Corporate clients and governments have made good progress in understanding the critical role design can play for them. The time is right to take them another step further and lead the way once more. If you’ve worked inside or with a design and innovation consultancy, please share your experience in the comments. Like this article to help others to discover it.